The book book breaks down everything that is involved in creating each of these creations. Streat explores the history of each weapon and breaks down not only how the LEGO model works but also gives a history of each weapon and how the real one works. 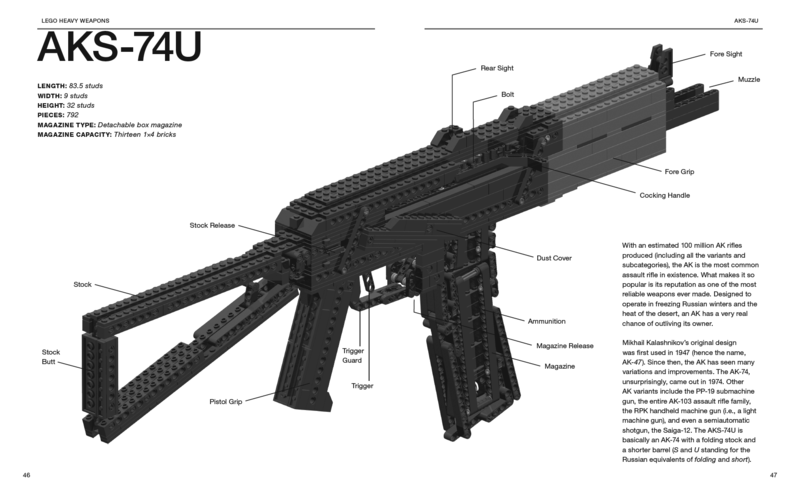 LEGO diagrams give an overview of how all the pieces of the LEGO gun works and how the pieces fit together. Sprinkled in are Streat’s comments about his building techniques and commentary about his inspirations, to get a feel for his building inspirations. Each of the building instructions break down in an easy to follow manner. The guns themselves are broken down into multiple parts – like the grips, muzzles, trigger, bolt, etc. – and then each part is broken down to a visual list of all the pieces required for that part then each step shows the required pieces to assemble that step, like actual LEGO instructions. The construction and the models are very intricately built and detailed and appear to be very accurate to my untrained eye. As someone whose experience with guns is restricted to paintball and movies, they guns look very accurate to the pictures I have seen of the weapons in the book. Since I didn’t have the parts on hand to fully build out any of the models in the book in time to review it, I wasn’t able to build any of them yet. These realistic weapons do shoot LEGO bricks with some accuracy according to Streat’s writings, with each weapon using magazines to load the ammo, and I really look forward to building and playing with them. My one complaint about the book is minimal. Since it is a black and white book, colors are a bit hard to tell. In a small bit about colors at the beginning of the book, it shows six pins and compares the colors. Unfortunately, it’s hard to tell them apart as the colors scale between shades of gray. It’s a minor issue and more a limitation of publishing rather than the book itself. Of course, this is negligible when the visible parts of the weapons themselves are predominantly black. 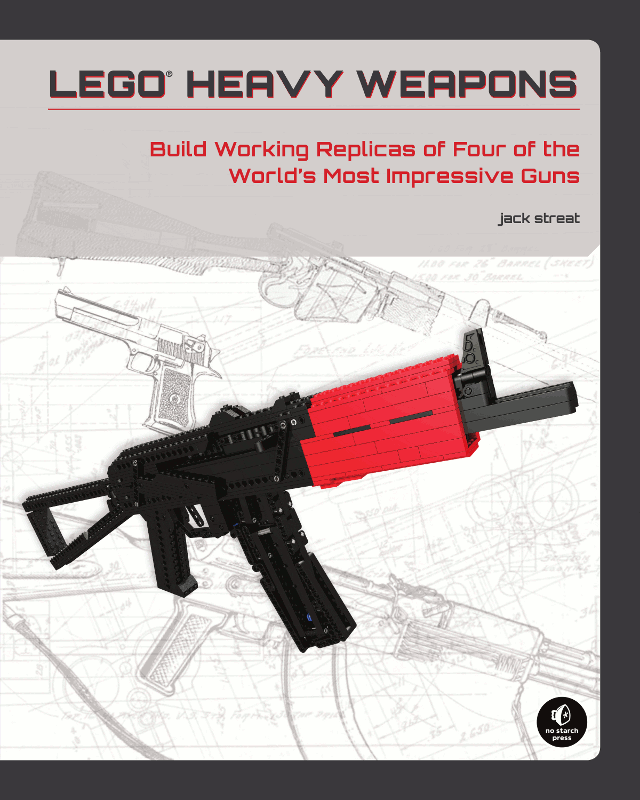 LEGO Heavy Weapons is a good book for not just learning how to make realistic LEGO weapons, but to also see how advanced mechanical things can be built with LEGO bricks. The book is very informational and well organized, and I look forward to attempting to build models from the book.